Our first reading is the story of the prophet Elijah’s ascent into heaven and the testing and succession of his protégé, Elisha. The lead-up to Elijah’s ascension is somewhat comical, showing the persistence of Elisha, and his boldness in asking for a double share. The story makes Elijah the greatest of Israel’s prophets—he does not die, but is bodily assumed. Because of this story, there was an expectation in Israel that he would one-day return. The same was thought by some of Moses, hence their appearance in our Gospel reading. 2:1 Now when the Lord was about to take Elijah up to heaven by a whirlwind, Elijah and Elisha were on their way from Gilgal. 2 Elijah said to Elisha, “Stay here; for the Lord has sent me as far as Bethel.” But Elisha said, “As the Lord lives, and as you yourself live, I will not leave you.” So they went down to Bethel. 3 The company of prophets who were in Bethel came out to Elisha, and said to him, “Do you know that today the Lord will take your master away from you?” And he said, “Yes, I know; keep silent.” 4 Elijah said to him, “Elisha, stay here; for the Lord has sent me to Jericho.” But he said, “As the Lord lives, and as you yourself live, I will not leave you.” So they came to Jericho. 5 The company of prophets who were at Jericho drew near to Elisha, and said to him, “Do you know that today the Lord will take your master away from you?” And he answered, “Yes, I know; be silent.” 6 Then Elijah said to him, “Stay here; for the Lord has sent me to the Jordan.” But he said, “As the Lord lives, and as you yourself live, I will not leave you.” So the two of them went on. 7 Fifty men of the company of prophets also went, and stood at some distance from them, as they both were standing by the Jordan. 8 Then Elijah took his mantle and rolled it up, and struck the water; the water was parted to the one side and to the other, until the two of them crossed on dry ground. 9 When they had crossed, Elijah said to Elisha, “Tell me what I may do for you, before I am taken from you.” Elisha said, “Please let me inherit a double share of your spirit.” 10 He responded, “You have asked a hard thing; yet, if you see me as I am being taken from you, it will be granted you; if not, it will not.” 11 As they continued walking and talking, a chariot of fire and horses of fire separated the two of them, and Elijah ascended in a whirlwind into heaven. 12 Elisha kept watching and crying out, “Father, father! 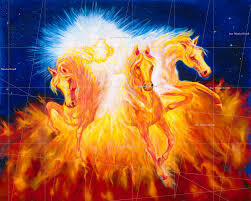 The chariots of Israel and its horsemen!” But when he could no longer see him, he grasped his own clothes and tore them in two pieces. Our psalm is a vision of God’s glory. to witness the judgment of his people. Two references to “the glory of Christ” make this reading a good choice to pair with the story of the Transfiguration. Paul desires that the Corinthians “pierce the veil” to find the glory shining in their hearts—the glory of God as shone forth in Jesus Christ. 4:3 If our gospel is veiled, it is veiled to those who are perishing. 4 In their case the god of this world has blinded the minds of the unbelievers, to keep them from seeing the light of the gospel of the glory of Christ, who is the image of God. 5 For we do not proclaim ourselves; we proclaim Jesus Christ as Lord and ourselves as your slaves for Jesus’ sake. 6 For it is the God who said, “Let light shine out of darkness,” who has shone in our hearts to give the light of the knowledge of the glory of God in the face of Jesus Christ. As throughout his Gospel, Mark tells the story of Jesus’ transfiguration simply but vividly. “Such as no one on earth could bleach them,” is a detail that is his alone among the Gospel writers. The transfiguration culminates and affirms Jesus’ ministry. He is the prophet both like Moses and like the great Elijah. But Jesus knows this moment is just for them for now—it will not be understood correctly without his subsequent death and resurrection. It is those events from which his glory truly comes. 9:2 Six days later, Jesus took with him Peter and James and John, and led them up a high mountain apart, by themselves. And he was transfigured before them, 3 and his clothes became dazzling white, such as no one on earth could bleach them. 4 And there appeared to them Elijah with Moses, who were talking with Jesus. 5 Then Peter said to Jesus, “Rabbi, it is good for us to be here; let us make three dwellings, one for you, one for Moses, and one for Elijah.” 6 He did not know what to say, for they were terrified. 7 Then a cloud overshadowed them, and from the cloud there came a voice, “This is my Son, the Beloved; listen to him!” 8 Suddenly when they looked around, they saw no one with them any more, but only Jesus. 9 As they were coming down the mountain, he ordered them to tell no one about what they had seen, until after the Son of Man had risen from the dead. The Scripture quotations (except for the psalm) are from the New Revised Standard Version Bible, copyright © 1989 by the Division of Christian Education of the National Council of Churches of Christ in the U.S.A., and are used by permission. All rights reserved. The Psalm translation is from The Book of Common Prayer. Commentaries are by Epiphany ESources, 67 E. Main St., Hornell, NY 14843, www.epiphanyesources.com , copyright © 2018. All rights reserved. Permission is given to copy for congregational use, with attribution.